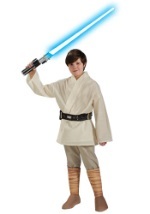 This is the ultimate deluxe kids Jedi costume. The woven shirt with the attached tunic is tan and the pants and attached boot covers are a dark brown. Elastic in the waist keeps the pants comfortable and flexible, but the sash and belt make the costume look great. 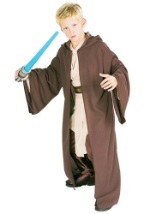 When you get an official Star Wars Jedi lightsaber and Jedi braid, you'll make all the other Jedi's look like amateurs!